So much fun. After briefly playing yesterday I was flooded with ideas to try so this morning I cleared a space on my desk and had some fun. 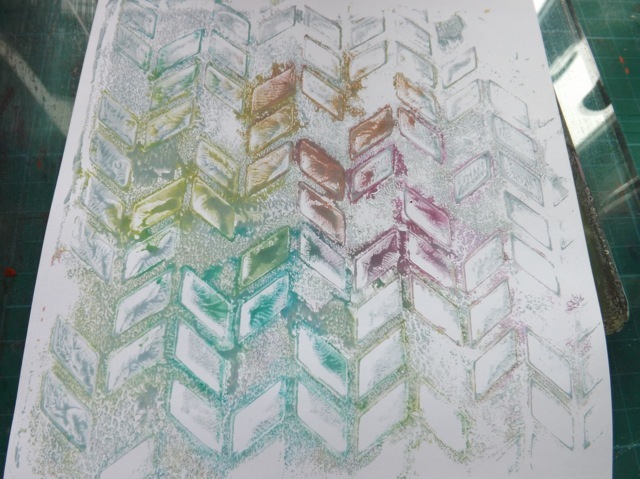 A couple of things – as I said yesterday, I am quite sure I read someplace that using inks on the plate was not recommended as it could stain it. To be honest, I’m not bothered about having a pristine plate, but even so my gut feeling is that a clean plate and an oiled plate will make the process work better. I THINK that both the oil and the acrylic medium sort of protect the plate from allowing the ink to really sink in to it. But even if it DID, the baby oil cleaning will pull out any deeply embedded ink. But you have to decide if you want to risk it. All I can say is thus far I’ve not had any problems getting the plate clean when I’m done. Let me start off by adding a bit of info regarding the acrylic medium options, from yesterday’s post. 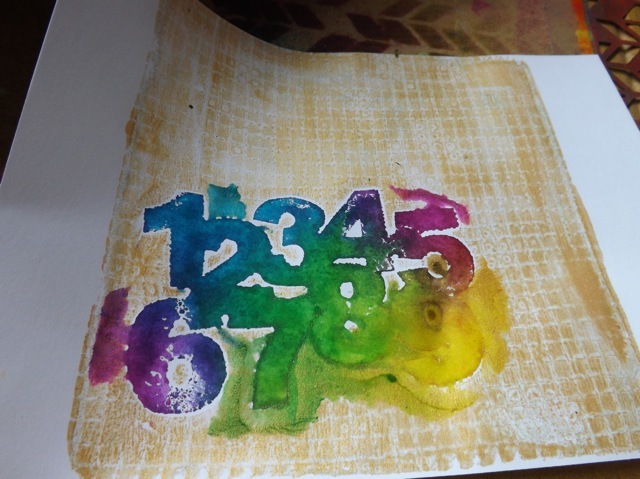 The medium seals, perhaps not totally, but significantly, the Dylusions spray inks. And that is what I’ve been using. Other inks may not work the same. I you think about it, when you pull a print, what is at the BOTTOM of the plate is going to end up on the TOP of the print. I haven’t taken photos, and my camera is recharging at the moment, but I did brush over those prints and while the ink does move a little, it isn’t anything LIKE as smeary as usually it would be. I’ll snap a photo r two when the batteries are fully juiced up. Now, on to the further play. The first idea came to me as I was looking at the very inky stencil. Stamping off the excess ink when you use a stencil in the normal way is a pretty well-known technique. But as I was looking at it I though Why can’t I put the stencil on the plate and both stamp off the ink and pull a print thru it at the SAME TIME? So that is exactly what I did. 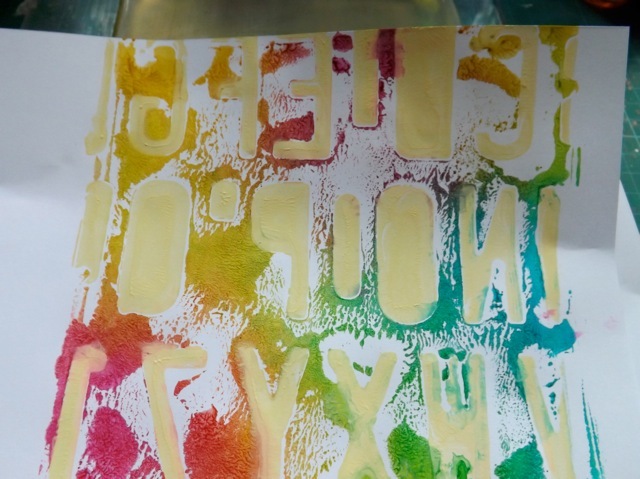 Now, I had used a letter stencil and we all know how they need to be reversed to read right when you pull a print. Obviously the ink was on the wrong side, but I still did it. Bearing in mind I tried to be quick once I had the idea, but I wasn’t lightning fast. The ink was already starting to dry. 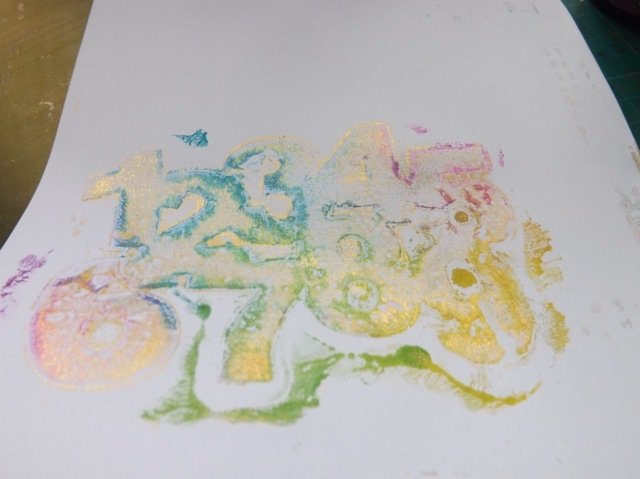 Even so I got a reasonable ghost print by removing the stencil and pulling the paint as well as the ink that squidged into the paint from making the first print. That told me, in theory, that the process would work. So I thought about the steps and the best way to get set up. 1. I cleaned the plate and got the brayer clean and ready. 2. I squeezed out a dollop of paint onto the plate but didn’t roll it out. 4. 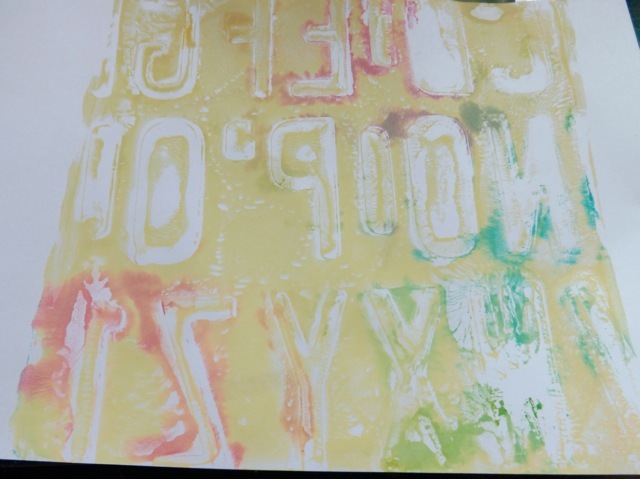 I rolled out the paint QUICKLY and popped the inky stencil, ink up, on the plate then pulled the print. 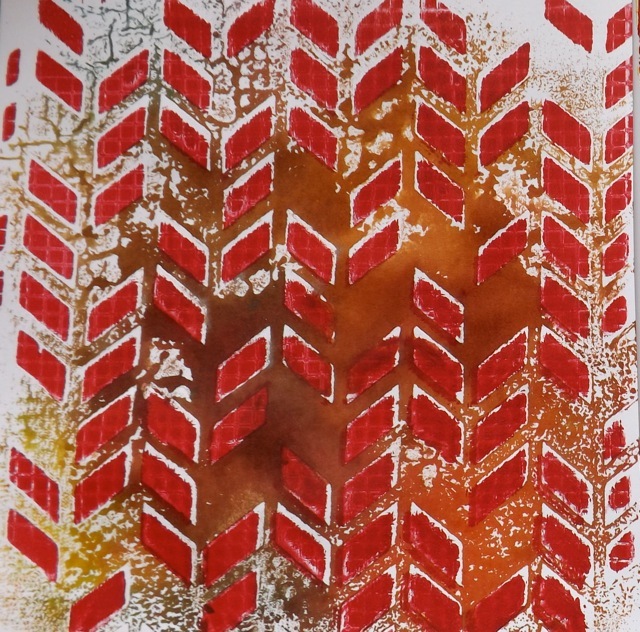 That pulled the ink off the stencil and the paint thru the stencil at the same time, giving me my two-layer print. Again, the ink from the stencil migrated to the painted surface and once I pulled off the stencil I could pull the ghost. I felt like light paint would look best but then I saw that metallic gold tube from the circles AJ page a few days back. I decided to use more of a mask, so I sprayed the ink onto one of my home-cut ones. 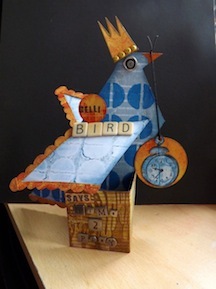 This is cardstock covered with contact paper, then cut out, so the ink really beads up. It didn’t matter at all. 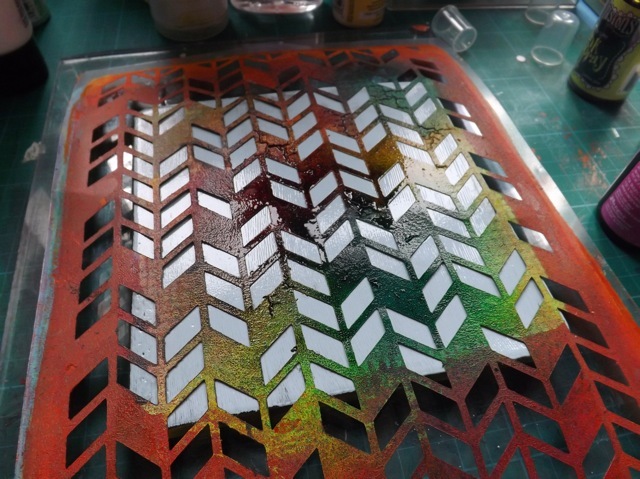 Oh, and I also pressed some plastic canvas into the paint to texture it before laying on the inky mask. 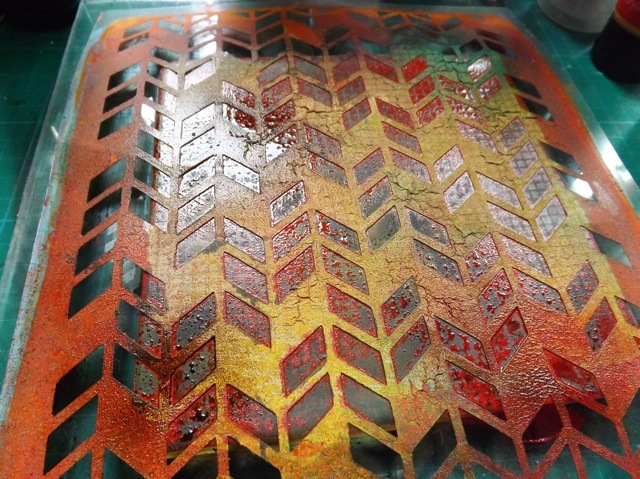 When I pulled the print the ink spread to fill the areas where it had beaded up, as well as oozing into the paint on the Gelli plate. So cool! and the ghost print is just crying out to become something, but I don’t know what yet! But then, before I removed the stencil, I sprayed on a bit more yellow ink thru the stencil. THEN I removed it and pulled that print. Like that one a lot too! I’ve got a couple more things to try/show but this is already very long and photo heavy so I’ll stop it there. I would really love to see any play you get up to with this so do drop me a comment and add a link. Have fun….. 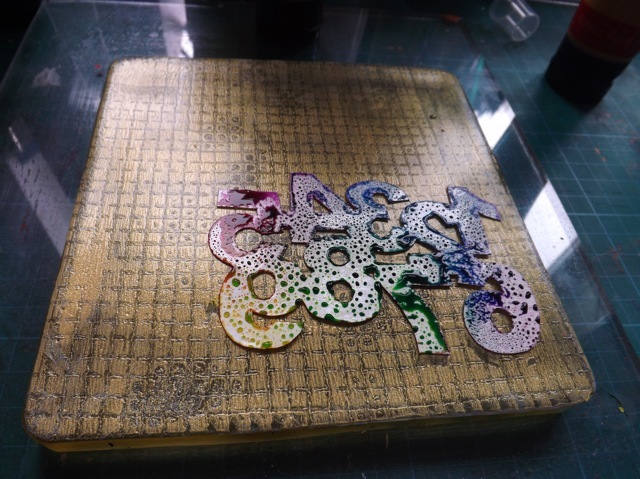 Thank you for sharing your experiments with spray inks on Gelli’s (and everything else you share). I will definitely try it! Read yesterday’s and today’s entries and I like how this is going. 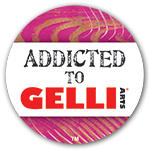 I can’t wait for it to get warm enough to start playing with my gelli, too. You have given me SO many ideas. and now I know what I can use and what I shouldn’t. 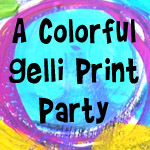 Of course, I don’t own any of those dylusion inks, so I’ll probably not be able to play with that technique on my gelli. My inks are all homemade, so I’ll heed your warning. Have fun and pray for warm weather…. So very cool! 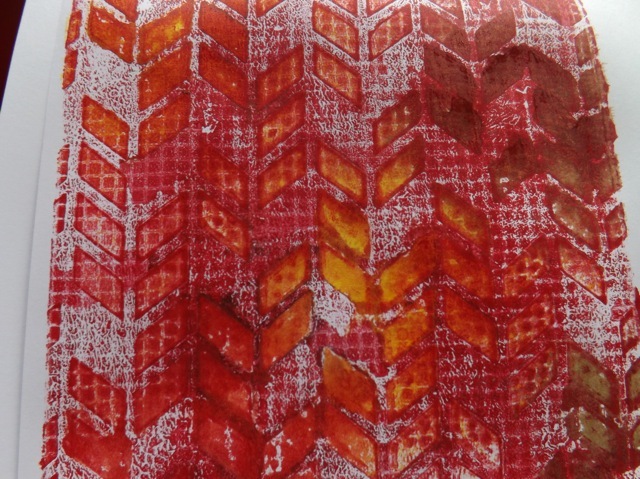 I used the dylusions inks on my gelli plate and had no problem with it staining. 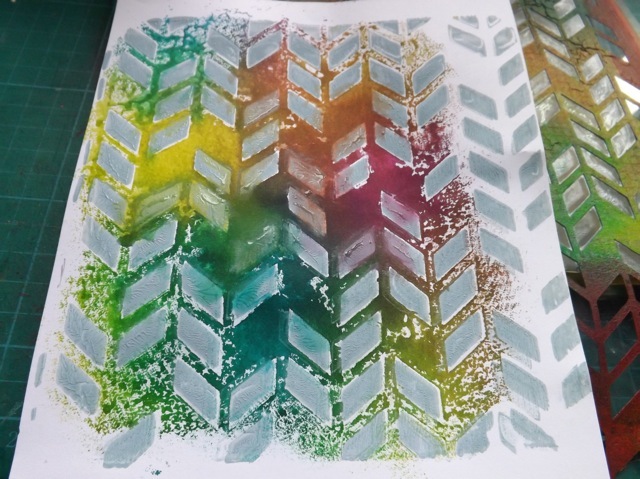 I also used watered down acrylics in spray bottles which made a cool watercolor affect that wasn’t water reactive like the dylusions. I have never used permanent spray inks, like the mister heuy’s, but even if the plate does get stained, I don’t think that would affect the plate other than it wouldn’t be clear. Take care!